Celebrate the Lily This May! We have about two weeks left of May, which means there are about 14 days remaining to celebrate May flowers. Of course, we love flowers and think that any variety is perfect for enjoying anytime. But, it’s often fun to give flowers – and to keep them in our homes – during a certain month that are associated with that month. One of the May flowers we’re loving right now is the lily. The lily is the designated birth flower for May and it’s a fragrant bloom that’s ideal for keeping in a vase – or for surprising someone special with. The lily is a low-growing perennial that has a bell shape and two, very large, oblong leaves. It blooms in white and it’s sometimes called Lily of the Valley. The lily represents sweetness and humility. When you want to tell someone, “You make my life complete,” give the lily. The following are some facts, figures, and trivia about the May lily. The lily is also known as Our Lady’s Tears or Mary’s Tears. These names come from Christian legend, as some believe the names stem from the Virgin Mary’s weeping as Jesus was crucified. Saint Leonard, a brave French soldier, chose to live as a hermit to commune with God, and legend says he spilled a dragon’s blood and Lilies of the Valley popped up in the very spot. 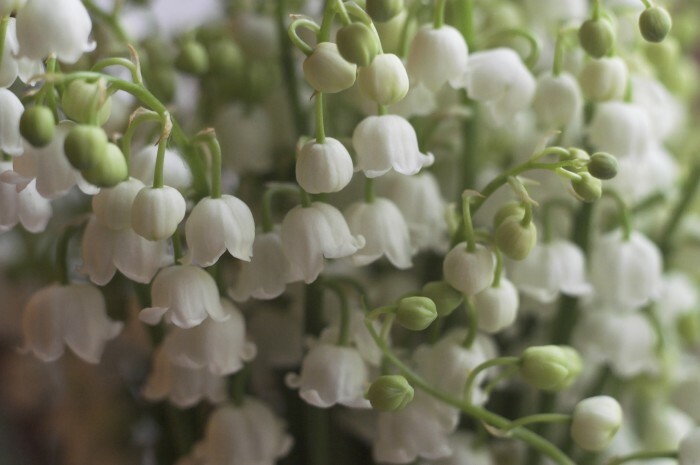 All parts of the Lily of the Valley are poisonous, if consumed. Ostara, a German virgin goddess, is associated with the lily, which symbolized life to Pagans. The lily is also called May bells, May lily, or “muguet” in French. The lily’s scientific name, “majalis,” means “of belonging to May”. The lily represents the return of happiness. Do you love the lily as much as we do? Do you grow lilies or give them often? If so, feel free to share your experiences with the flowers in the comments below.